This past weekend I attended my brother’s college graduation in Ellensburg where he graduated from Central Washington University. The ceremony was held at the school’s 4,000 seat football stadium. 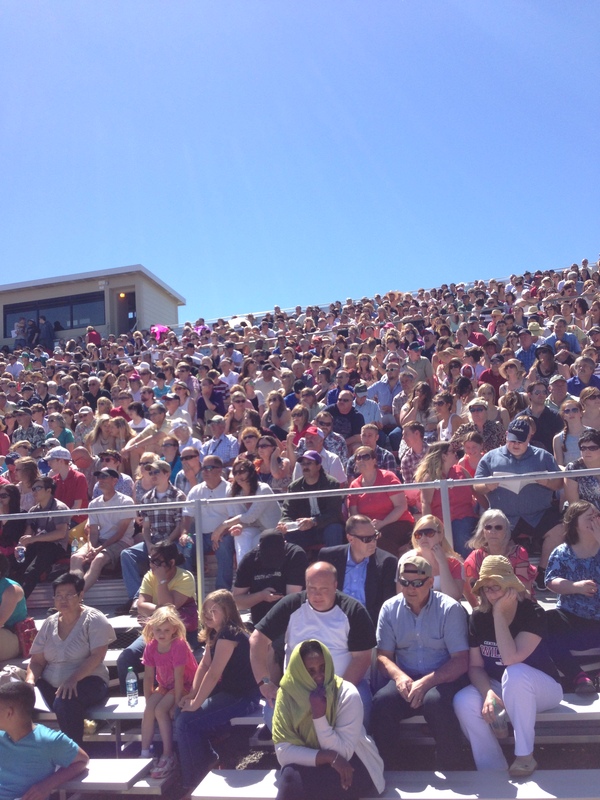 With 750 graduating students for that particular ceremony, we knew a rather large crowd relative to the seating capacity of the facility would show up. With this basic reasoning, we arrived at around 1 p.m. for the 2 p.m. ceremony. Although people were already taking their seats, we got there early enough to find four seats together near the top and by an aisle. We were ready for the waiting game to begin. 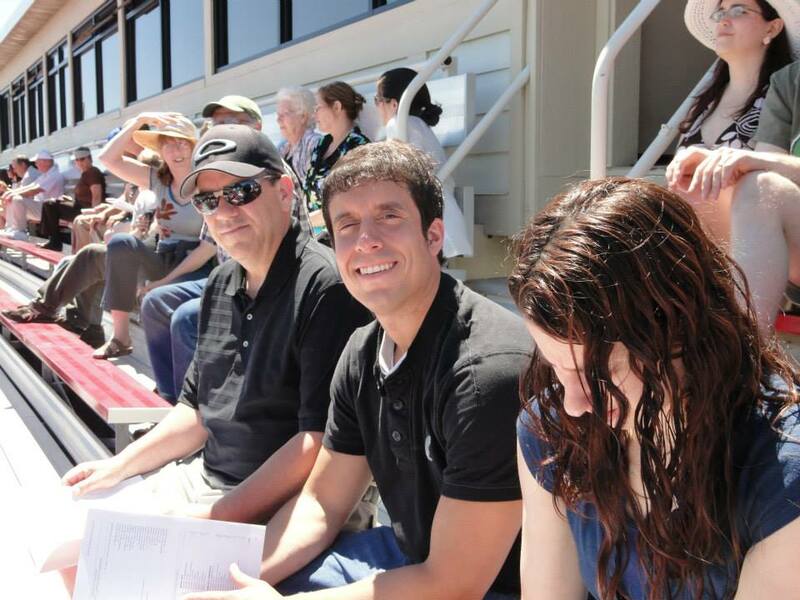 When we first sat down in our seats we had plenty of room (my dad on my right and sister on my left). On this particular day it was hot in Ellensburg. The sun was shining and its rays shot right at our faces and warmed the metallic bleachers considerably. While the minutes before the ceremony went slowly, the rush of spectators came quickly. By 1:30 p.m. we were completely surrounded by people. I couldn’t get over the excitement of feeling completely crunched in between a bunch of strangers in uncomfortable heat . The crowd did start to fill up quickly and soon enough, it was packed. Even though I felt a little claustrophobic and a little dehydrated, I was not going to let most things get to me. Hey, I was there to support my brother on his special day. Because of this attitude of mine, I didn’t mind the lady in front of my mom who decided to pop open a huge umbrella to shield the sun while at the same time shielding our view. I tolerated the kids who kept running amok through our own row, bumping our knees while no parents stepped up to put an end to the madness. I decided not to say anything to the guy in front of my dad and I who decided to stand up during the whole graduate procession, thinking that his son needed to see him waving his hands and acting like a fool for thirty minutes. I also even gave a pardon to the people who decided to clog the aisle way stairs (right where we were sitting), thus creating a major traffic jam for everyone who was actually using the stairs for their intended purpose. But what really touched off my boiling point was the graduation attendee who sat right behind me, the person who you can find in almost every crowd: The Funny Guy. I dislike “The Funny Guy” in crowds for three main reasons. 1. They are never funny. 2. They are annoying. 3. You are forced to listen to them. This past Saturday, the funny guy we had the misfortune of sitting in proximity of fit all three characteristics above. The moment he and his family sat down, the wisecracks started coming. He joked about their graduate, other graduates, the camera display, the weather, the university president, the commencement speaker, and pretty much everything else both related and totally unrelated to the ceremony. Before commencement even began he had managed to annoy the hell out of my family and everyone else that was sitting close by. Another aggravating characteristic about “The Funny Guy” is that he always makes sure to talk at a level so that everyone can hear him. You see, he actually thinks he is a comedian and that others appreciate his running commentary. I will never know why these types of people don’t realize that everyone despises them. I guess it is just their ego and total misconception of reality that leads them to think otherwise. For some reason, they think that the event they attend is about them rather than what is happening on the field/floor/stage etc. When the ceremony started, the guy did not let up. With the heat escalating, the ceremony dragging on, and the jerk behind me still not shutting up, my dad and I checked out and left our seats and went down to the field level to the standing room only section. I watched and filmed my brother receiving his diploma in peace, away from the most bush league half rate comedy show I had ever heard in my life. I looked way up in the bleachers and saw my sister and mom who decided to stay in their seats and when I did that I swear I could still hear the loudmouth cracking some joke about the length of the ceremony. This was the picture I took after leaving my seat. As you can see, it was an absolutely packed house. People who like to show off their less than stellar comedic talents in public situations need to stop. Realize the reason why you are actually at the event and just go from there. You know, Twitter was made for a reason. If you have to give a funny play-by-play about the event you happen to be at, do it through your Twitter account to people who actually choose to follow you. I am sure your 10 followers will get a real kick out of it. But please don’t make other people suffer who are just trying to enjoy the event and honor what is happening. Much appreciated. Don’t Blink. 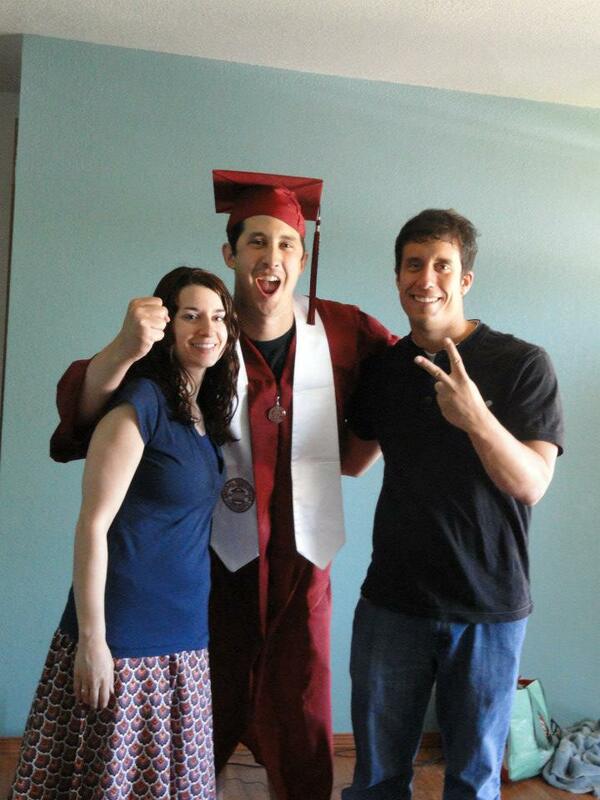 Congrats to my brother for graduating! Don’t Blink. 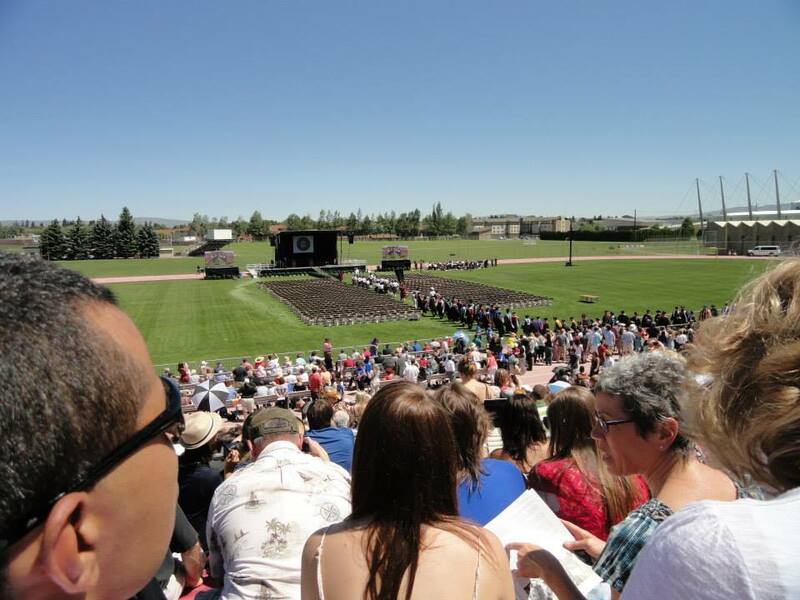 This entry was posted in Uncategorized and tagged Central Washington University, crowds, Graduation, The Grove by brent. Bookmark the permalink.